How can you have a duck pond if there aren’t any ducks? How can you have Time if there aren’t any Time Lords. The Time of the Doctor was everything you would expect from the capstone of the Matt Smith era: beautiful, touching character moments; ingenious, retrospective plot explanations; and ever so slightly not as good as he deserved. We got answers: what were the cracks, who blew up the TARDIS, where the Pandorica Alliance came from, the origins of River Song, what “Silence Will Fall” actually means. What we were missing, though, was a story. Specifically, we were missing Kovarian’s story. Somewhere on that flying Papal Mainframe there was a little, dark-haired girl, raised in the way of the Church, who believed, really believed in the goodness of the Doctor. Maybe she was even his “companion” in the town called Christmas. Who then had to grow up, and grow old, while the Doctor stayed, while the siege of Trenzalore lasted, stretched into “long, bitter war”. That little girl is Kovarian, and Kovarian is the mirror of Amelia Pond. Amelia – Amy – had her life turned upside down because the Doctor failed to come back. But Kovarian’s life was destroyed because he stayed. The Destiny Trap is her story. She goes back in time to change history and in so doing creates the very circumstances that shaped her life in the first place. That’s a terrible and tragic story, maybe a bit too heavy for Christmas, and Francis Barber is a busy actor. But it must have happened pretty much like that, because we’re seen all the other bits. We rather deserved to see this bit too. And while the first half of The Time of the Doctor actually works rather well, the second half descends into more of a series of disconnected vignettes, with Orla Brady’s Mother Superis Superious Spuriousius… whatever… Tasha Lem narrating. But saying “and three hundred years passed” and sticking some glue on Matt Smith’s face does not a sense of passing time create. There’s a hint of a story going on with the young Barnoble – the little boy that the Doctor does come back for – with maybe a hint that the young man at the end is his son or grandson, but it’s not explicit. We really don’t see any kind of change, we don’t get to follow the live of the people of Christmas, we don’t see their village evolve at all, which undermines the idea that this siege last for ages. It’s like “State of Decay” with the Doctor playing the Three Who Rule. And that can’t be right. There’s a weird sense that Steven Moffat listens to the criticisms of his writing and rather than addressing them head on, almost tries to retcon them out. So the Silence aren’t an ancient race that’s been secretly ruling the Earth since forever, but are really just genetically modified priests (so that thing the Doctor does at the end of “The Day of the Moon” is ethnic cleansing not genocide after all. So that’s all right then). And I think Moffat probably doesn’t understand the point of confession if he thinks that forgetting you’ve done it straight afterwards would be any part of the practice. (Whereas Priests who would forget what you’ve told them when they’re not looking at you, they would be ideal for confession.) The whole way that they behave – the way they seem to live in nests, the whole Nosferatu hanging from the ceiling thing – does this make any kind of sense for a religious order? And I’m still not entirely sure why you wold want a priesthood who can shoot electricity out of their fingers. Or fail to answer: the Doctor spends at least three hundred years failing to answer that question. Or is that why he can’t leave? It holds onto him until he answers, and it’s only when the Crack moves itself that he’s free of the pull of Trenzalore? And he’s pretty adept at telling lies inside the truth field by the end, too – when he says to the young not-Barnoble that he has a plan, and then tells Clara he hasn’t got a plan; one or other statement isn’t true. Minor niggles: I would have liked to see the Doctor’s thirteenth regeneration leave the “scar in time” (from “The Name of the Doctor”) at the top of the church (ish) tower, regardless of his life continuing. And I’d have rather the Time Lords opened their crack in the Universe through that Dalek command saucer, blowing it up, than weaponising the Doctor’s regeneration to the point of absurdity. I thought that – in a moment of Chekov’s Gun – the appearance by young-again Matt Smith in the TARDIS would be revealed as the new Doctor wearing the hologram clothes, to comfort Clara and ease the shock of the transition for her. And, lovely as it was for Matt to be reunited with Karen again for the “Raggedy Man, good night”, surely for the Doctor it should have been River. More serious niggles: more of Moffat’s trademark dubious sexual ethics and misjudged comedy. I’m all for normalising and accepting naturism. 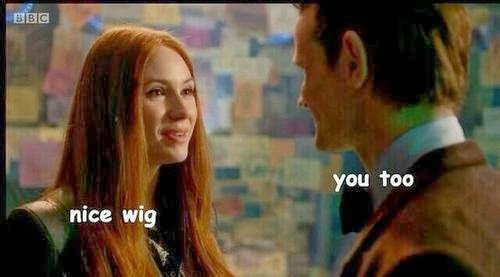 But the Doctor is naked here for laughs, but Clara doesn’t like it, but he still goes and exposes himself to her family, and then he makes her get naked, and is variously inappropriate, but it’s all working up to a wig joke… yes, it’s been an extended gag about Matt getting his hair cut for another role. And that’s before we’re introduced to yet another “powerful woman” with a sexualised relationship with the Doctor. Why not just save time and have the Papal Mainframe be the Library from Silence in the Library and River be the Space Pope after all. But I guess Alex Kingston is a busy actor too. You do think maybe Moff just doesn’t sit down and think these things through, though. It’s like the way that the Daleks forgot all about the Doctor in the last appearance… only to learn all about him again this time (assuming any of them survived the latest wipe out). Likewise, at the end of “The Day of the Doctor”, the Grand Moff sets up what everyone expected to be a perfect “quest for Gallifrey” arc for Peter Capaldi’s season eight, only to immediately burn that plot thread by saying: “and the whole of the Eleventh’s story was how the Time Lords tried to come back… again… and they couldn’t because it would mean another Time War”. It’s not that these are actually bad ideas, but – I hesitate to say this after the agony of the stretched-out Silence arc, but – might this not have worked better as a season arc? Or at least played over several episodes. Possibly Matt’s decision to quit meant Steven had to collapse several stories into one. Even at an hour, this is, ironically, too short. That might explain why this feels so… exposition-y. Or maybe it’s just Moffat’s habit of machine-gunning us with ideas, rather than ever developing and examining any of them. And the Silence arc does – just about – come to make sense. Admittedly it needed the Doctor and the Space Pope to sit down and literally explain it to each other… as Lawrence (you wondered how I was going to get a mention of him in) Miles once said: “who would have thought? After all that the enemy turned out to be two pages of technobabble”. 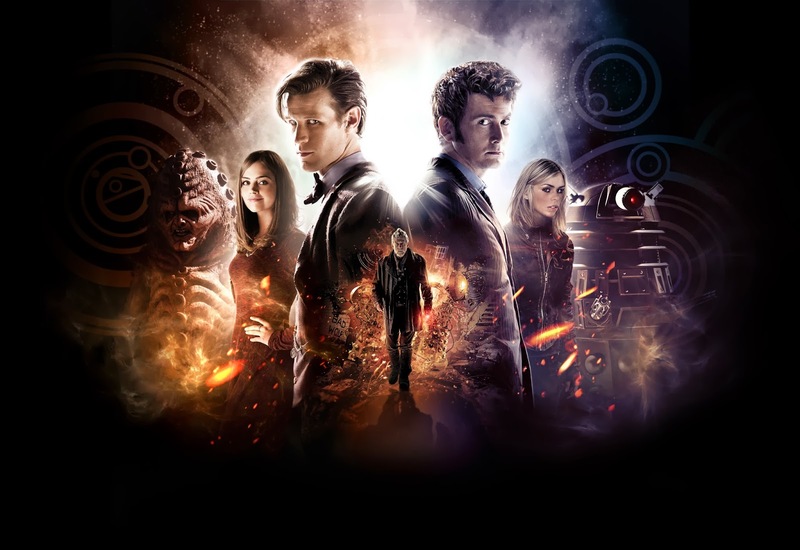 That they might choose the victory of the Daleks over the recommencement of the Time War suggests that the Church’s logic was a bit pickled, but it is (sort of) logical that the Silence arc – like River Song, who of course comes from them – is backwards compared to the Doctor, his end is in their beginning. The Timey-Wimey of the Doctor, you might as well say. And so, having reached a point where a message from Gallifrey would actually mean something to him, he can finally understand what this is all about. And there are beautiful moments, beautifully played, along the way. Some people say that small, beautiful moments are what life is all about. Sunrise on Trenzalore and the passing of Handles – whatever qualms I might have about the Doctor using bits of dead Cyberman to make a friend out of – managed to turn a joke about a reminder from a digital assistant into something moving. Clara’s gran finding just the right words at the right moment – in spite of Moffat having skipped over putting the work in to establish Clara’s family, and was Linda a step-mum? – was a lovely Christmas “family” moment, something true against the sentimental grain of the season. And Matt’s final speech – again, even though I dislike the “reset”, typical of Moffat undoing any consequences of the Doctor’s centuries-long sojurn – with his imagined seeing of lost companion Amelia (how like “Logopolis” or “The Caves of Androzani” that the past companions return to salute their Doctor) and his final casting aside of the bow tie. And bravely to accept that we all change; the final admittance that Ten was wrong to want to stay. Oh, and “The Time Lords gave him a new regeneration cycle” is a rubbish way to get around the limit of thirteen. No, tossing in continuity references to “The Five Doctors” doesn’t make it clever. It’s cheap fan-fic. (Yes, we all know that the Time Lords offered the Master a new regenerative cycle in “The Five Doctors”; we all also know that most of us assumed they could do that because he’d stolen a whole new body. If he could just have another go, why did he almost blow up Gallifrey to try and prolong his life in “The Deadly Assassin”? No don’t say it’s because he’s a psycho.) It’s a “phew that was close” moment. It makes the Time Lords into Tinkerbell and the Fairy Godmother. And Clara’s speech to convince them to help him was done better – by Moffat – in “The Curse of the Fatal Death”. It makes the Doctor’s actual death less than the spoof version. The Doctor’s life needs to be more important than that, more important than “of course we’re going to carry on”. If Moff had had a genuinely interesting idea for getting the Doctor off the mortality hook then I’d be delighted at his “cleverness” and go along with the “and now he’s not eleven he’s thirteen” guff. I like that Ten (who was actually Eleven) regenerated into himself (as Twelve). It almost makes sense of his regeneration blowing up the TARDIS when he changed into Eleven (who is really Thirteen); he’s trying to regenerate into himself again but doesn’t have a compatible container (i.e. a handy hand) to catch the regeneration energy, so it fries him and the TARDIS together. But discovering that Moffat didn’t have any idea better than that makes me think… he shouldn’t try to tell a story he doesn’t have. Also, why does Clara now live on Rose Tyler’s estate? Next Time… A new body… at last. Doesn’t Peter Capaldi have a beautifully interesting face, weird, expressive, and alive with possibilities? So, who’s up for “The Twenty-Five Doctors”? Day 4735: If the Economy Is Getting Stronger Why Are the Queues at Food Banks Getting Longer? The latest figures show that unemployment has fallen to 7.4%, the lowest since 2009 (i.e. now lower than Labour left behind), and an email from Mr Danny Alexander arrives to celebrate that there are now thirty million people in work. Inflation, down to 2.1% is also at a four year low. But there’s also been a huge rise in people getting emergency food from food banks – as highlighted in today’s Opposition Day debate in the House of Commons. We need to cast some light on this debate; we need some understanding of what’s driving this increase. At the moment it’s all too easy for the Left to cry “Evil Tory Government” as though that was all the explanation necessary (and for some of them, all too often, it is); while the Right respond with “poor people have made poor decisions”. The Tory responses in the debate – essentially to blame it all on Labour – won’t wash. Worse, they’re a cowardly approach, denying that the Coalition has changed anything. The actual cold, hard, statistics – employment, inflation, interest rates, or my personal favourite the gini coefficient that shows that for the first time in thirty years, and uniquely among Western nations, inequality in the UK has actually fallen (as a result of the Coalition’s changes to taxes and benefits pushing the tax burden up the income scale) – all point to the UK having worked well together to mitigate the harm of the recession and to be moving into recovery. But people don’t believe statistics. Or rather, they’ll believe a statistic that says the use of food banks has trebled, but not ones that say the economy is growing. And with inflation still running ahead of wages it’s easy to see why: a lot of people still have to live with their pay frozen – yes, including MPs’, despite what you’ve heard; IPSA’s recommendation still only being a recommendation so far, but massively unhelpfully adding to the prevalent (and probably untrue) “them and us” narrative. By spreading the pain so broadly we’ve avoided the horror of huge spikes of unemployment that the recessions of the Eighties saw – unlike the Thatcher governments, the Coalition hasn’t “written anyone off” – but at the expense of a whole lot more people feeling the impact of 2008’s economic disaster. Hysterical commentary from Labour supporters, cherry-picking this food bank statistic and saying “we haven’t had food parcels since the Second World War so things are worse than they have been since the Second World War” simply is not credible in light of the overall picture. We can’t compare the use of food banks now to how they were used in the recessions of the Eighties (or Seventies) because they simply didn’t exist then. In fact, as an extra-governmental route for the “haves” to help the “have-nots” they’re a perfect example of Mr Balloon’s “Big Society” (though the Conservatories have dropped that as quietly as Labour dropped Plan B). But we cannot in conscience ignore this evidence either. It’s no good denying that some of the decisions of the Coalition government have caused genuine hardship, either directly by cutting people’s benefits (through the benefit cap, through the second room bedroom tax, through continuing to employ the evil of ATOS) or indirectly by the increase in decisions to freeze or stop payments (decisions often later overturned). Actually, Mr Iain Drunken-Swerve’s DWP (the Department of Workhouses and Prayer, a ministry well known for their accurate use of statistics) does deny that decisions to freeze or stop payments have led to more people using food banks. Which comes back to begging the question: what does? The most urgent question has to be are more people in poverty? There are a number of fairly hefty policies in place that are supposed to stop this: Labour’s minimum wage and tax credits; the Coalition’s triple lock on pensions; Liberal Democrats also managed to strong-arm the Chancellor into indexing benefits in line with inflation through the difficult years when it was highest. So are these failing? If so which, and how, and how do we stop them failing? How much of this increase in food bank use genuinely reflects an increase in poverty? Is it possible that there are other factors? I can think of a couple of alternative, not to “explain away” the rise, but to try to think about there being more to the picture. The most obvious would be people who were previously choosing “eat” over “heat” now have another option: instead of deciding that they must have food and then shivering under a duvet, they can now pay for the heating bill and go to the food bank and get some emergency supplies. What has happened is that an “invisible” poverty has become a visible one. Another is what you might call the “NHS” effect. If help wasn’t there, people wouldn’t use it. Since its inception, NHS use has grown almost exponentially even as the nation has become fitter and healthier. Similarly, as more food banks are introduced, and more people become aware of food banks, so more food banks are used by more people. Their accounts (available on the Charity Commission website) say that they’ve demonstrated that their franchise model is “scalable and sustainable”, which suggests that they’re not so much answering an acute need as having found a necessary niche. (Incidentally, almost all the stories of food banks seem to stem from an October press release of theirs. Though oddly, in researching this, I came across virtually the same story – same source, the Trussell Trust, same number, 350,000 people needing food parcels – but from May relating to 2012. You could also say that if people in need are discouraged by shame from looking for “hand outs”, hearing that many more people are using the food bank reduces that disincentive, in a way “permitting” the people who need the food to go and claim it. Let me emphasise though that just because I can hypothesise alternate explanations for some of the rise in food bank take-up, that doesn’t mean that they’re right. That’s why we need to be asking questions. I don’t want to rain on the economic parade, but Labour and Labour supporters have latched onto this as “A Big Thing”, and I can’t say that they’re wrong to do so. I know that it’s a big cause for concern, for me and many other Liberal Democrats. We’re concerned for the human tragedy, obviously, but also because it seems to fly in the face of statistics that say the economy is getting both stronger and fairer. Policy ought to be evidence-based (and unlike Labour I won’t just grab a statistic and say “so there!”), and we need to understand what this piece of evidence is telling us, so these are questions for which we need an answer. Age: Between his twelfth and last incarnation… hang on if Davy T used up regeneration eleven AND twelve now, doesn’t that make Mr Dr Matt both twelfth AND last…? Uh oh! Awesomeness: the Catharsis of Spurious Morality! Cuddles: there’ll be no impropriety with the Inquisitor! AKA: m'learned doctor of law (allegedly; Boatyard, Backyard, Graveyard, Knackers’ Yard… Keeper of the Great Key; Peter Guillam (Tinker, Tailor); Neville Badger (A Bit of a Do); Colonel Mustard (Cluedo); Colonel X (no relation) (Press Gang); …and James Bond on the radio; he’s the immortal Michael Jayston. He'd better be in the Christmas Dr Woo! Awesomeness: Thwarted the Daleks’ Master Plan. In leather. Cuddles: Loves her brother Brett Vyon. Also shot him. Cuddles: Able Seaman Ben Jackson. Jamie doesn’t get a look in. Awesomeness: Created UNIT. And the Time Lords. Exiled the Doctor to Earth. Killed Troughton, Cast Pertwee. And left! Not bad for a couple of afternoon’s work. In “The Curse of Fenric”, the Reverend Wainwright’s faith is broken not by German bombs, but by British ones. British bombs killing German children. Remember that. The Doctor is a traveller in Time and Space. That’s where all this begins and where it always comes back to. But there are two ways to travel: never looking behind you, and there and back again. 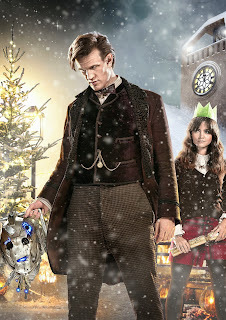 Over the (fifty) years, the Doctor has exemplified both modes, reflecting the mores of the production team of the time. They represent quite different world-views, different approaches to making “Doctor Who”, different ideas about what the series is saying, and what – and who – it’s for. “Never look behind you” is innovative, risk-taking, “out there” in a Universe that is often a dark and strange place where light is a guttering candle; iconoclastic, it breaks continuity, changes things shakes them up, causes chaos, creative and destructive; this is “Doctor Who” typified by the likes of Verity Lambert or Philip Hinchcliffe, Mac Hulke or Andrew Cartmel. Let’s call this group “Explorers”. “There and Back Again” is honour, tradition, moral strength, defending “hearth and home (counties)” from the weird and other, usually with the idea that “home” is somewhere “safe” to return to and worth defending; it builds upon what has gone before, strengthens and deepens, forges connections, brings order, reactionary and nurturing; it’s the “Doctor Who” of Terrance Dicks and Barry Letts, of Graham Williams era Guardians and space princesses and John Nathan-Turner’s middle years. I thought about naming this group “Nostalgics” but that seems pejorative, so let us say “Conservers”. Change is said to be one of the keys to the enduring success of Doctor Who, so it’s important that we don’t say that one mode is “better”, even if each of us will certainly have a preference for one over the other. Russell Davies, for all of the Barry Letts’ Era tropes that he revels in, lavishes his love on even, is clearly an “Explorer”. He pushes the Doctor into new places all the time: Platform One, planet Midnight; Jackie Tyler’s boudoir… His signature companion is Rose Tyler and the first and most important thing about Rose is that she wants to get out there, leaving her past behind. And when she leaves, she’s gone further than anyone else, to a whole new Universe, and she’s still going. Steven Moffat, in spite of his reputation as Mr Terror, is just as clearly a “Conserver”. So much of his writing is about family and the threat to family and “home”. His signature companion is Amy Pond, who is defined by her absent family, and whose story is all about how she and the Doctor become family, how he “fixes” her (ugh) by un-orphaning her, and when she leaves it’s because the Doctor gives her a nice house and when she leaves again it’s to be with her husband. The most telling difference between the two groups has to be their attitude to the Time Lords. It should be pretty obvious that, as the television series “Doctor Who” developed, the Time Lords became a metaphor for Britain, just as the Daleks were a metaphor for the Nazis. It was pretty inevitable that the biggest, most important war ever would end up being between them. And that it would destroy them both. But, unlike the Daleks – there being obviously only one opinion to be held on the Nazis – Britain means different things to different people and therefore so do the Time Lords, whether it’s the stern, patrician, nay Reithian, but basically good intergalactic ticket wardens of Barry Letts or the befuddled, introverted, vain academics of Robert Holmes; the overseers of galactic order (and shipping lanes) under the supervision of the White Guardian under Graham Williams or the dark and enigmatic architects of a history that conceals their worst mistakes as conceived by Lawrence Miles. And there is a very good case for saying that the Time Lords have always been gits. I know because Alex made it. After all, practically the first thing they do is execute the Doctor. But that’s not always been the perspective of subsequent writers and producers. 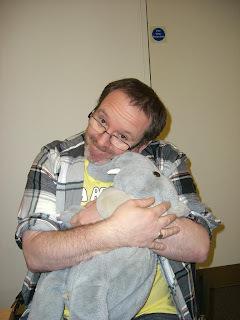 Or even of co-writer of “The War Games” Terrance Dicks! Britain, for good or ill – in fact, for good and ill – moulded the modern world, whether by Imperial conquest, or the conduct of the slave trade, or the economic influence of the East India Company, or the expeditious, even perfidious, promises of the territory of Palestine to at least four deeply antagonistic factions, torturing, maiming and murdering our way across five continents and four-hundred years all blindly convinced that technological superiority conveyed moral superiority and utterly deluded about our “basic British decency”, and the only remote claim to absolution being that maybe we were slightly less bad than other people at the time would have been, and maybe that we did it to stop people – Napoleon, Kaiser Wilhelm, Adolf Hitler – who would have been worse. This completely schizophrenic view of our own past – that the British Empire was an appalling crime against humanity that at the same time was the only thing that saved the world from absolute despotism; whether we are, at heart, good or bad – informs the writing of the Doctor and the Time Lords. Is he fleeing from them, rejecting their decadence or corruption? Or is he upholding their principles even when they themselves fall short? Is he the renegade or the exemplar? Or is the Master? And, I have to say, the conclusion of “Genesis of the Daleks”, where the Doctor – on behalf of his people – chooses to reject retro-genocide of the Daleks, in spite of all their evil, has long weighed upon me. Out of that evil, will come something good. What, really, does the Doctor mean by that? It can’t just be the future alliances brought about against the Daleks; surely those races could have become friends anyway. No, it’s something more than that, more fundamental really. My settled feelings came to be that the choice was never between Daleks and no-Daleks. Because Genocide of the Daleks would have made the Time Lords into the Daleks. So the choice was between a Universe of Daleks, and a Universe with Daleks and Time Lords. A Universe where there was only obedience and extermination, and a Universe where we even have a choice. In a way this is the only way that “Remembrance of the Daleks” does not flatly contradict “Genesis” morally and logically. The Doctor gives Davros a choice. He may be tricking him, he may have set everything up to force Davros’ hand, he may know perfectly well that Davros is never going to choose to surrender the Hand of Omega or stop his quest for ultimate power, he may have goaded Davros to the point of frothing lunacy and wound him up past the point where he’s thinking rationally, but he still – just about – gives him the choice to do it or not to do it. At that point in Genesis, the point of exercising ultimate power – the “moment”, you might say – the Doctor paused. And because he paused, he realised that he could make that choice. Davros doesn’t, literally doesn’t stop to think. That’s the difference between Dalek and Time Lord. And that difference, that there still is a difference between Dalek and Time Lord is one idea that runs deep in the heart of “The Day of the Doctor”. In the prologue piece “Night of the Doctor”, Paul McGann’s Doctor tries to rescue a crashing space pilot, Cass, and she refuses when she recognises him as a Time Lord. “At least I’m not a Dalek!” he protests. “Who can tell any more?” she retorts. But we can tell. “Are you coward or killer?” demanded the Emperor Dalek, and Chris Eccleston’s Doctor replied “Coward every time.” And he was right. Every time. Alex’s reaction to “The Day of the Doctor” – and he’s not wrong – was that Moffat has now succeeded in un-writing all of Russell; that, dear lord, it’s the Leekley Bible, with the Doctor on a hero’s journey to find his lost father(land); that Moffat’s taken the very heart of Doctor Who – the Doctor running away from Gallifrey – and turned it on its head, with a Doctor running to find his home. And of course that’s what Moffat has done: he’s a “Conserver”, he needs the story to be “There and Back Again”, the future must build on the past, the hero has to return home. He made his views on Britain – that plucky little island standing up to the Nazis – pretty clear back in “The Empty Child”, and nothing since has changed that. Britain stood against the Nazis; Gallifrey must stand against the Daleks. That’s the way the tide in the affairs of “Doctor Who” is running at the moment. But then, as Simon pointed out, “The Three Doctors” unwrote the Doctor’s exile to Earth, took him away from the safe, cosy UNIT family and cast him out into the Universe, leading eventually to the great trinity of “Explorers” Baker/Holmes/Hinchcliffe. Perhaps I should actually review the episode a little bit. I think “The Day of the Doctor” succeeds far more as a tribute to fifty years of the Doctor than it does as a story. The Daleks, for all the show-offy Time War CGI were hardly in it except to blow up on demand, and would they really all shoot each other in a big circle? (Alex wanted me to call this review “Gallifrey Ducks”, and I’m mightily tempted.) Though I post-facto justify that by reminding him that Rose as the Bad Wolf – and let’s be honest, it’s pretty clear that the Moment and the Bad Wolf are one and the same here; though it’s rather lovely that the clockwork box evolves itself into a big red button that is clearly a Rose – annihilated every Dalek everywhere in Time and Space. So presumably that included all the Daleks surrounding the suddenly-missing Gallifrey (less any that actually did shoot each other!). The Zygons – really? the Zygons? Even as a gift to Davy T? – were forgotten in the big resolution (I mean are they still locked in the Black Archive negotiating that treaty? And why was it necessary for Osgood and Osgood-Zygon to work out who was who by means of the inhaler when nothing came of that? It’s not like Osgood-Zygon was anice Zygon before). Nice transformation moment, mind you. And they did a good job of disguising the fact they only had one Zygon costume. And on second watching I spotted the moment Kate got replaced (having worried that she’d been a Zygon all along!). It does, though, support my belief that the Doctor’s gabble to Ood Sigma at the start of “The End of Time” was him putting a spin on his reasons for not going straight to the Ood-Sphere from “The Waters of Mars” (though I still prefer my own theory that there’s a bit of non-linear storytelling going on and he goes and visits all his companions before he sets off to the Ood-sphere and is just remembering them all again as he staggers to the TARDIS about to explode. Okay, maybe allowing him one last visit to Rose). The 3D – better mention the 3D since it was a big deal, and we went to the cinema on the Day-After-the-Day-of-the-Doctor so as to see it; a disaster all of its own, but that’s another story – the 3D was patchy at best. The helicopter stunt was pretty good; the “look we’re a movie now” style titles stood out very well, as you’d expect from lettering over a deep field background; the Time War was mostly a lot of coloured lights (and the first and only other time since “Remembrance” that the Daleks have fired bolts rather than beams, I guess to make the 3D work. Ish.) Bits of stone and rubble flying out of the screen as the TARDIS took out a squad of Daleks sort of worked. The best bit, as it happened, was a tree. As Elizabeth was chased by the former-horse Zygon, one branch really did the sticking out of the screen thing. And ironically, the 3D Time Lord paintings (great in concept, though what were they doing on Earth and how did Liz 1 get hold of them to stick into her Undergallery?) looked completely flat. Or at least no better than they looked in 2D, when the zoom and look round gave just as much impression of 3D as the silly glasses. But none of that was important, because it opened in Totters Lane and Coal Hill School and had photos of past companions and Kate Lethbridge-Stewart name-checking her dad, and a joke about Cromer and another about UNIT dating, and a great big red countdown. The three Doctors played it beautifully. I’ll join the chorus who say that Chris did us a tremendous favour by bowing out of the anniversary, missed though he was, as it gave us John Hurt as the War Doctor. This will almost certainly – barring surprises – be the only time we get to see John Hurt’s incarnation, and it goes without saying what a shame that is. Moffat was spurred to write something clever (or fan-baiting) that allowed us to see the kind of Doctor who actually would fight on the front lines, while retaining the character integrity of Eccleston’s recently-regenerated post-Time War Doctor and McGann’s pre-Time War Time Lord (or the one who runs into the start of it; another neat nod there to the books, especially Lawrence Miles’ Faction Paradox works). There’s a sense of genuine progression from McGann’s weariness at fighting the injustice of the Universe (in the later Big Finish as well as “Night of the Doctor”), to Hurt’s ground to dust Doctor who says “No More” and breaks into the Omega Archive to steel the Moment. (Did the Hand of Omega let him in, do you think?) Hurt is perfect as the Doctor straight away, from the way he hides his shame from the TARDIS, to the way he can be acerbic to his older selves, right to the joy expressed when they think their way out of the trap of the last day. The way he can be wise, but not quite wise enough. And he speaks on behalf of the Twentieth Century series when, almost baffled, he confronts his Twenty-First Century selves for all that they’ve become. And to be fair, Moffat can wax lyrical when he tries: the man who regrets and the man who forgets being beautifully little vignettes of David and Matt as the Time Lord. Better than “skinny” and “chinny” anyway. The badinage between Doctors ten and eleven (or is that eleven/twelve and thirteen, now?) was clearly fashioned after the “The Three Doctors” and yet came across as more like friendly ribbing between siblings than the sniping between Troughton and Pertwee. But the two new series Doctors were much more than the comic relief. Fair play to David Tennant: he restrained his occasional habit of overplaying the anger and the suffering, to turn in one of his finest turns as the Time Lord, by turns funny, self-satirising, angry and sad. And bonus for befuddled on hearing the words “Bad Wolf Girl”. And Matt, Matt was as always wonderful. Some particular emoting nicely mirroring the extreme close up of half his face against half of Hurt’s. Impressive to see them go toe to toe and the younger man keep up with the old master. And I had genuine tears of joy when the three Doctors were joined by his other selves to make the twelve Doctors… and then my heart leapt even higher for “all thirteen”. Peter Capaldi stole the show with only his eyebrows. And then I was misting up again when Tom returned to our screens to steal the show right back; enigmatic, wise, cryptic, bonkers, Who Knows? Past self or future, or just eternally the Doctor. Along with the wonderful Paul McGann mini-episode it truly made this a proper anniversary. And it’s impossible not to think that Sylv, Colin and Peter D were there too, under those shrouds as the statue -impersonating Zygons. The Doctor dreams. Something that he can't quite grasp, gone but not forgotten, in a universe in a bottle, a place of last resort, a redoubt, somewhere forgotten, forgotten that he'd forgotten. A place within a place, worlds within worlds, even if all was lost they wouldn't all be lost, or lost but not all gone, not gone but forgotten. They're not gone but forgotten. He wakes. In “The Curse of Fenric”, the Reverend Wainwright’s faith is broken not by German bombs, but by British ones. British bombs killing German children. In “The End of Time”, the Doctor’s faith is broken by the High Council of the Time Lords’ decision to abandon the Time War against the Daleks, to let Arcadia fall, and to wipe out all of History in order to ascend, escape, run away to a higher plane. Moffat’s writing, mawkish, sentimental, won’t somebody think of the children though it may be, is a reminder of what the Doctor, in his long despair, has forgotten. In “The End of Time” the Doctor confesses that his stories of the Time Lords are always about how good and wonderful they were, but that that is how he chooses to remember them; that at the end, they became as bad as the enemy they were fighting. But that’s not necessarily true either; that’s how he really remembers them, from his darkest day, from the choices of the few – admittedly a Nuremburg Rally-full of the High Council, but few compared to 2.47 billion children – that drove him to despair. But the Time Lords are not the Daleks. They are not all the same. And they can choose. Gallifrey Falls. Or Gallifrey Rises. Those are the choices the Doctor takes into the moment. But he’s the Doctor. He’s always about being given two choices and finding the third. Gallifrey Stands. In “The Curse of Fenric”, Ace says to Wainwright: “Have faith in me”. In “The Day of the Doctor”, Clara and the Bad Wolf remind the Doctor of who he is, and through faith in them, he restores his faith in himself. Don’t get me wrong; I still agree with Alex. By rewriting the Last Day of the Time War, Moffat has turned “everybody dies” into “everybody lives”; he’s taken the ultimate message of Russell – “consequences” – and made it meaningless. I must confess, I felt the loss of Gallifrey deeply, a Universe without Gallifrey – without a Britain – was like a wound, it was to be unhomed. So good and bad, right and wrong, Explorer and Conserver, like the Time Lords, like Britain, like all of us, “The Day of the Doctor” can be both at once and all at the same time. After all, it’s “Doctor Who”. Age: Fortieth Century Girl. Or Boy. Awesomeness: I shall summon assistance… HELP! HELP! HELP! Cuddles: Thank you Eckersley, but you’re still a traitor! Awesomeness: Royal Beast of Peladon. God of all Fluffy Things. With Horn. Cuddles: Klokeda Partha Mennon Klatch. One of the filthiest ditties in all Venusian history. Awesomeness: Trained UNIT agent; able to resist the Master’s hypnotism; blew up the Devil; told the Brigadier he’d have to chain her up and fling her into a dungeon. Cuddles: Traded in third Dr Woo for a younger trendier model. Still got patronized. Huge extended family; we’ve shared a lift with her, you know. Awesomeness: IS the Doctor! IS Tom Baker! Now… enjoy the Anniversary Special and we’ll be back tomorrow… it’s faaaaar from being all over! Keep Warm! Awesomeness: Never Mind the Most Important Punch in History… he’s IN A JAMES BOND FILM! Awesomeness: Dr Woo’s second best friend! Awesomeness: That’s Silly! More Crowning Moments of Awesome than an entire European Monarchy. Age: A New Body… At Last! Cuddles: A bit Skull Beneath The Skin. Without the Skin. AKA: Mrs Liz Shaw; Mr Tolliver (Poirot’s Problem at Sea, with Carrie); the nicest man in the World, Geoffrey Beevers. Cuddles: Moffat: Time Crash. Gatiss: Can We Kiss Peter? Cuddles: Shares a room with Tegan. I’m just saying. The TARDIS is infinite and they’re sharing a room, is all. Other close family relationships keep getting messed with by the Doctor. Leaves to spend more time with the Big Bang Dog. Age: 21. What? You wanna make something of it? Awesomeness: Big Yellow Truck. Big Glass of Chianti. Big Effing Gun. Cuddles: Pete. Near miss with Elton. Pete. AKA: Jaqueline Andrea Suzette Tyler (née Prentice), Rose’s mum, the indescribably gorgeous Camille Coduri. AKA: editor of the Eighth Doctor’s Adventures post-Ancestor Cell (aka Time’s Grumpy Amnesiac); producer of the continuing adventures of Jago & Litefoot for Big Finish; creative consultant to BBC books, author of “Theatre of War” and many, many more. Possibly responsible for “The Ancestor Cell”. Awesomeness: I'd tell you... but then I'd have to shoot you! AKA: a nameless fugitive from the Federation, absolutely definitely not Kerr Avon, oh no indeedy. If asked about Maylin Tekker, deny everything. The immortal Paul Darrow. Awesomeness: Defeated the Sontarans. In bacofoil. Cuddles: Embraces gourmand experience. And Dastari when necessary. Cuddles: Embraced Cypber-technology. Afterwards, rather cold. Awesomeness: Inventor of the Daleks. Also the spork. Cuddles: the TARDIS console during explosions. Much prettier than a computer (yuck barf). Cuddles: We Will Now Change the Subject. Awesomeness: World Shaper. Yes, that is a big one! Creag an tuire! Cuddles: Snogged the Doctor. And the Master. AKA: Bob Dovie (might be significant ;), Henry Noone, Chancellery Guard Captain Henzil; author of (amazing, moving) The Rocket Men, (amazing, violent) Wrath of the Iceni, (amazing, er, incendiary) The Burning Prince, (amazing, toytastic Charlie) Solitaire, and Jago&Litefoot Beautiful Things (which they are). AKA: writer of TORCHWOOD: A Day In The Death (aka the good one); THE SARAH JANE ADVENTURES: Mark of the Berserker, The Mad Woman in the Attic, The Nightmare Man (aka the AMAZINGLY good one); The Rapture, Master, Terra Firma (aka the good one with DALEKS in it) and far, far too much more. Awesomeness: His Wizard is David Warner. Yes THAT David Warner. AKA: friend of Benny; author of The Time Travellers, and of best ever Dr Woo book (that has badgers in it) The Pirate Loop, and of outstanding Companion Chronicles Sara Kingdom Trilogy and Oliver Harper Trilogy (love those Cold Equations), and lots of other stuff. Makes short films, you know. AKA: Editor of Doctor Who Magazine, Script Editor for BBC Death Zone, Producer of Doctor Who for Big Finish. Oh and he writes and acts too. Could probably do Strictly one day, as well.